What is literary theory? Is there a relationship between literature and culture? 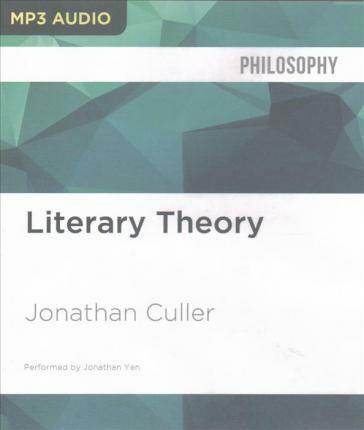 These are some of questions addressed by Jonathan Culler in this new edition of his highly popular Literary Theory: A Very Short Introduction. Culler, an extremely lucid commentator and much admired in the field of literary theory, uses easy-to-grasp examples as he outlines the ideas behind schools of criticism that can otherwise be quite daunting, such as deconstruction, semiotics, and postcolonial theory. He explains "theory" not by describing warring "schools" but by sketching key "moves" that theory has encouraged, and by speaking directly about the implications of theory for thinking about literature, human identity, and the power of language. In this Second Edition, Culler includes much new material, including a discussion of the "death of theory," a look at topics such as trauma theory, eco-criticism, and the link between the theory of narrative and cognitive science, plus a new chapter on "Ethics and Aesthetics." Shedding light on everything from literature and social identity, to poetry, poetics, and rhetoric, Literary Theory is a welcome guide for all lovers of literature.